With the Steelers preparing to face the Baltimore Ravens in the AFC Championship today, it is good to remember that this date has been a good one in the history of the franchise. On January 18, 1976 the Steelers won their second, and second consecutive, Super Bowl ~ defeating the Dallas Cowboys 21-17 in Super Bowl X. 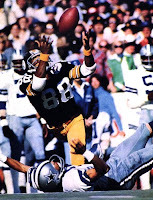 This game made Lynn Swann a household name ~ his leaping catches becoming the stuff of legends ~ but it was the defense, which sacked Roger Staubach seven times, that carried the day. The Wikipedia page for the game is here, and you can see video from the game here.